In case you haven't heard.... there will be a regional gesneriad show and symposium in Delaware this fall, jointly sponsored by the DAVS, NCAC (that's us) and Liberty Bell chapters of The Gesneriad Society. The official announcement and details are now up on the Delaware African Violet and Gesneriad Society's website. Registration fee for symposium/lectures is $20 ($25 after September 1, 2012). The organizers would like to officially express their appreciation to the staff of the University of Delaware Botanic Gardensfor their assistance in making this event possible. Oh yes, there is some catching up to be done. The Delaware African Violet and Gesneriad Society's March 2012 newsletter has a handy schedule for coaxing gesneriads to bloom/look their best just in time for a show. (It may look familiar: it's by Brian Connor.) The April 2012 newsletter has information on the regional show, happening on September 30, 2012 at the University of Delaware Botanic Gardens in Newark, DE. Check out their website and newsletters here. The April issue of Gleanings, The Gesneriad Society's free e-newsletter (available here), has a photo of one of my favorites, Sinningia 'Tomorrow'! Well, okay, there's a lot more to the issue: it's like a teaser/trailer for the 2012 and 2013 Conventions -- there are photos from the Puget Sound Gesneriad Society and the Toronto Gesneriad Society. (Are you on the fence about attending? This might help nudge you a bit.) But wait, that's not all: there's a piece by Jaco Truter on a new species, Streptocarpus actinoflorus. And oh yes, there's more: photos from the Philadelphia Flower Show, upcoming events, and a bit on the formerly-Chirita gang. Kenneth Moore just reported on his gesneriad seedlings over at The Indoor Garden(er). This reminds me just how far behind I am on sowing seeds and spring plant maintenance. Craig Gibbon on Flickr has some photos of Streptocarpus species in situ, including some of Streptocarpus dunnii. And not on the web: if you're a member of the Gesneriad Hybridizers Association, you would have seen their recent issue which included an announcement that Vivian Liu will be speaking about hybridizing in Taiwan at The Gesneriad Society's 2012 Convention. The GHA meeting is definitely a "do not miss" event. 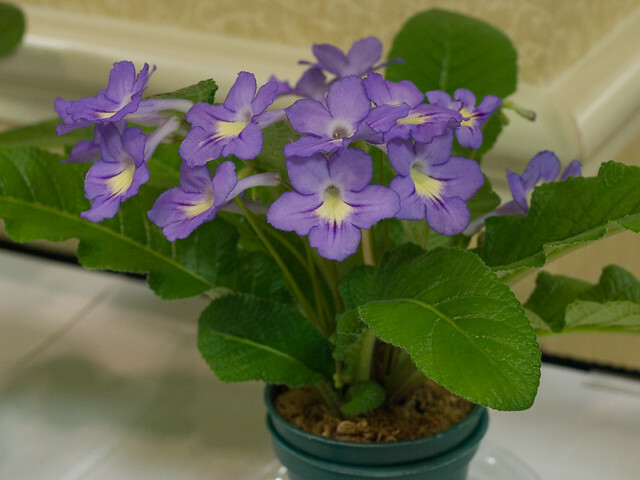 And a random photo to close things out: Streptocarpus 'Butter Blues' exhibited by Sylvia Taub at the 2009 Convention.